The enigmatic serenity of the Gymnopédies ... the hypnotic looping of the Gnossiennes ... the surreal fantasies of Embryons desséchés: Erik Satie's piano music is both idiosyncratic and prophetic. 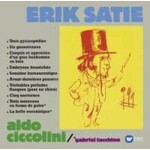 Aldo Ciccolini, born in Naples, but an adoptive Frenchman, affirms his reputation as Satie's most eloquent advocate in these recordings from the 1980s. When he died in early 2015, Ciccolini was hailed as "a giant of the piano".